Mushrooms contain just as high an antioxidant capacity as carrots, tomatoes, green and red peppers, pumpkins, green beans, and zucchini. Selenium is a mineral that is not present in most fruits and vegetables but can be found in mushrooms. It plays a role in liver enzyme function, and helps detoxify some cancer-causing compounds in the body. Additionally, selenium prevents inflammation and also decreases tumor growth rates. The vitamin D in mushrooms has also been shown to inhibit the growth of cancer cells by contributing to the regulation of the cell growth cycle. The folate in mushrooms plays an important role in DNA synthesis and repair, thus preventing the formation of cancer cells from mutations in the DNA. Studies have shown that type 1 diabetics who consume high-fiber diets have lower blood glucose levels and type 2 diabetics may have improved blood sugar, lipid, and insulin levels. One cup of grilled portabello mushrooms and one cup of stir-fried shiitake mushrooms both provide about 3 g of fiber. The Dietary Guidelines for Americans recommends 21 to 25 g/day for women and 30 to 38 g/day for men. The fiber, potassium, and vitamin C content in mushrooms all contribute to cardiovascular health. Potassium and sodium work together in the body to help regulate blood pressure. Consuming mushrooms, which are high in potassium and low in sodium helps to lower blood pressure and decrease the risk of high blood pressure and cardiovascular diseases. Additionally, an intake of 3 g of beta-glucans per day can lower blood cholesterol levels by 5%. Selenium has also been found to improve immune response to infection by stimulating production of killer T-cells. The beta-glucan fibers found in the cell walls of mushrooms stimulate the immune system to fight cancer cells and prevent tumors from forming. Dietary fiber plays an important role in weight management by functioning as a "bulking agent" in the digestive system. 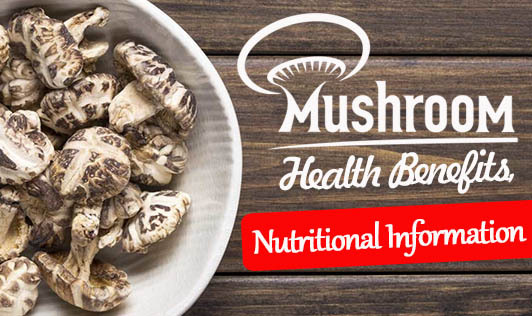 Mushrooms contain two types of dietary fibers in their cell walls- beta-glucans and chitin which increase satiety and reduce appetite, making you feel fuller longer and thereby lowering your overall calorie intake. Mushrooms are naturally low in sodium, fat, cholesterol, and calories and have often been referred to as "functional foods." In addition to providing basic nutrition, they help prevent chronic disease caused due to the presence of antioxidants and beneficial dietary fibers such as chitin and beta-glucans. One cup of chopped or sliced raw white mushrooms contains 15 calories, 0g of fat, 2.2g of protein, 2.3g of carbohydrate, including 0.7g of fiber and 1.4g of sugar. Although there are a large variety of mushrooms available, most provide the same amount of nutrients per serving, regardless of their shape or size. Mushrooms are rich in B vitamins such as riboflavin, folate, thiamine, pantothenic acid, and niacin. They are also the only vegan, non-fortified dietary source of vitamin D. Mushrooms also provide several minerals that may be difficult to obtain in the diet, such as selenium, potassium, copper, iron, and phosphorus. Beta-glucans are a type of fiber that is found in the cell walls of many types of mushrooms. Recently, beta-glucans have been the subject of extensive studies that have examined their role in improving insulin resistance and blood cholesterol levels, lowering the risk of obesity and providing an immunity boost. Mushrooms also contain choline; an important nutrient found that helps with sleep, muscle movement, learning and memory. Choline assists in maintaining the structure of cellular membranes, aids in the transmission of nerve impulses, supports proper fat absorption and reduces chronic inflammation. When buying mushrooms at the market, chose ones that are firm, dry, and unbruised. Avoid mushrooms that appear slimy or withered. Store mushrooms in the refrigerator and do not wash or trim them until they are ready for use.